The island of Santorini is the perfect choice for a sunshine wedding in an amazing location. The island has many beautiful accommodations and venues to make any size wedding work wonderfully. We can help you with all arrangement’s from the wedding itself to accommodations, venues before and after the wedding. Plus if you should decide to combine your stay on Santorini with a few days on a nearby island we can also help you with these arrangements. 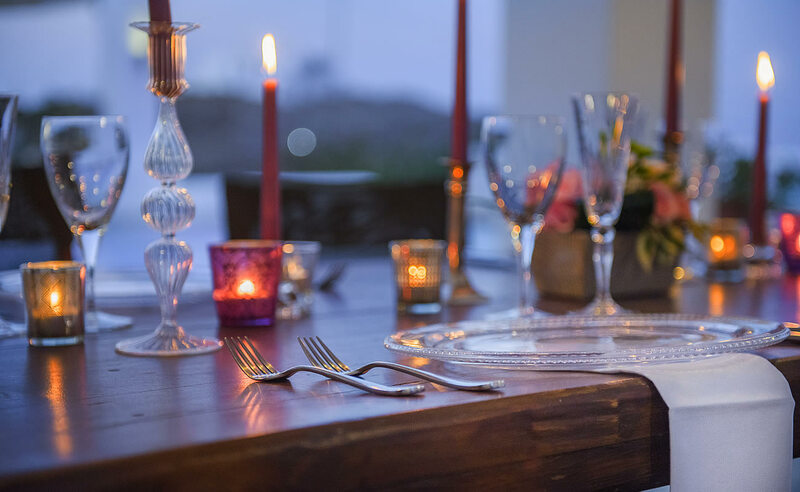 The island offers many beautiful properties which are ideal for small or large groups wanting to get together for that special occasion or wedding. Should you be looking for a quiet village location or something with wonderful Caldera views we can help you find that perfect property for your visit to Santorini. We have put together a special selection of Villas and Mansion houses that would suit such an occasion, this is just a small selection of what is available on this unique holiday destination. 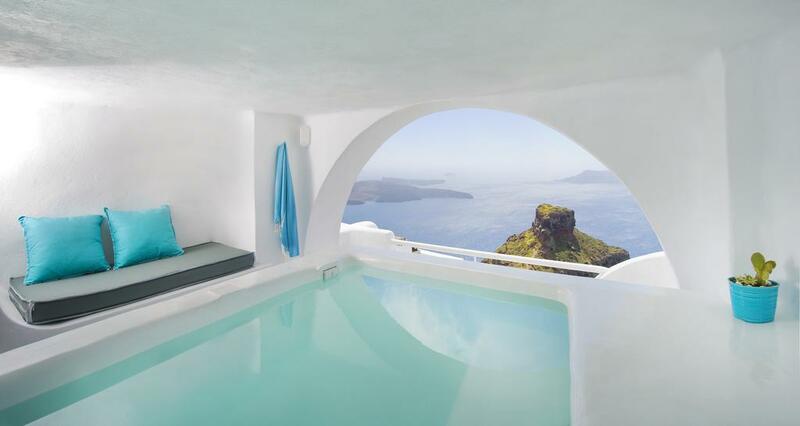 A collection of luxurious suites and cave rooms overlooking the Caldera of Santorini, Sofia suites can accommodate over 20 guests in true luxury. Each of the suites features a private plunge pool and the Exclusive suites offer both indoor and outdoor pools. Located in the area of Imerovigli with wonderful views and close to all facilities including shops, mini markets, and many good quality restaurants. This property will appeal to the most discerning guests and can be booked as individual suites or as a whole which can accommodate up to 20 people. This must be one of the best options for large groups that are looking for a private and quiet location with great views plus first-class accommodations. 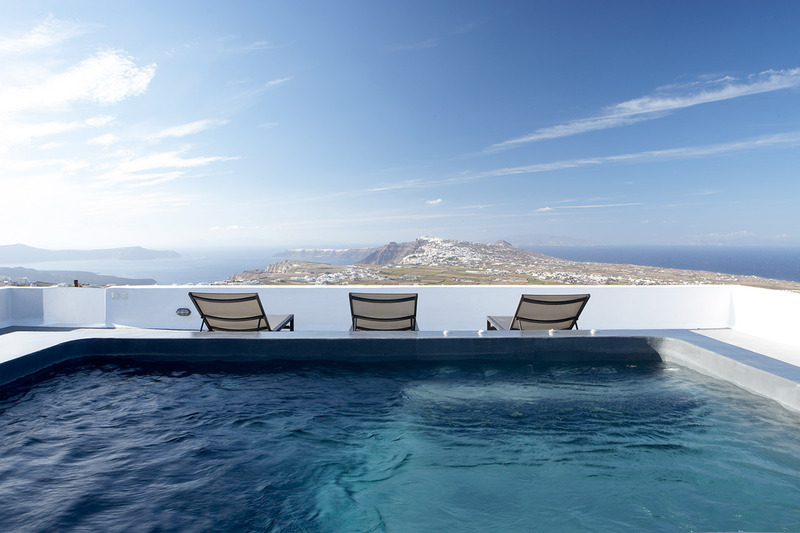 With 7 individual houses set in over 6000 sq meters of land, all but one of the houses feature a private pool and all offer wonderful views of the Aegean sea. Each house is self-contained and furnished in modern Cycladic style, the Anema Residence can sleep up to 36 guests and a freshly prepared breakfast is included each morning. 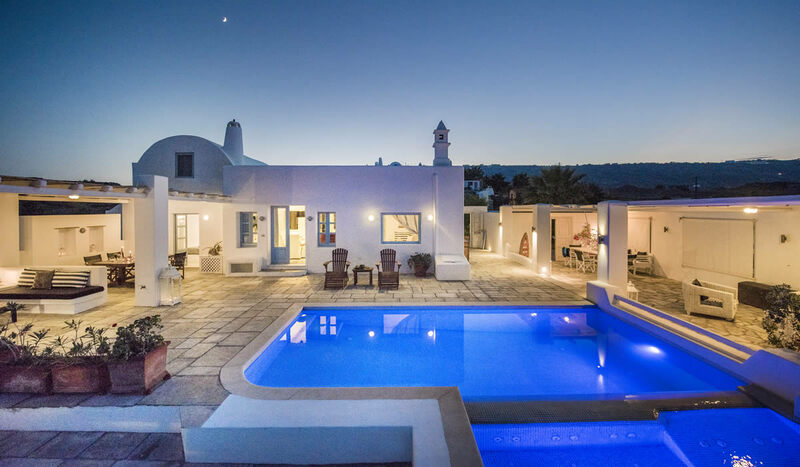 This house offers great views over the island and the unique Caldera of Santorini, located in the picturesque villa of Pyrgos with all facilities close by. The property has a total of 7 bedrooms and can sleep just over 20 guests in total comfort. Features include private pool and jacuzzi, spacious terraces and luxury accommodations. Due to the design the property can be rented as a whole or divided into 2 separate private villas. Beautiful suites and villas with wonderful views, this property has some of the most luxurious accommodation on the island. located in the village of Imerovigli which offers a great selection of shops, cafes, restaurants, and local amenities. The property has a total of 20 suites and 2 villas and can accommodate over 40 guests in first-class comfort and offer excellent facilities. To start each day a tasty breakfast is served on the private terrace of each accommodation. 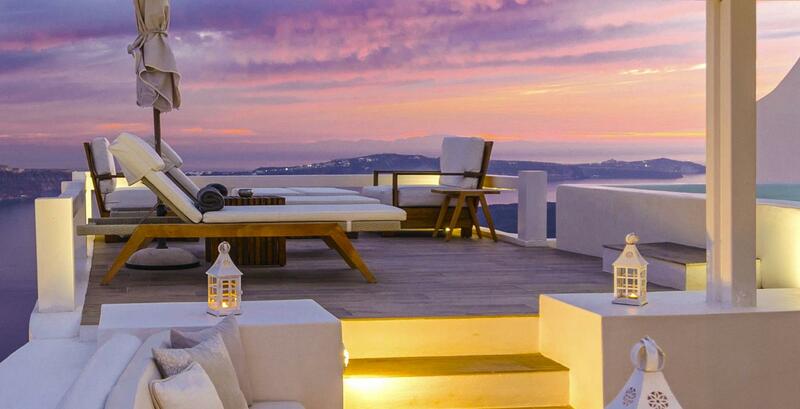 Amazing 5 bedroomed villa in a very private quiet location offering uninterrupted views of Santorini’s famous Caldera. This is one of the most luxurious villas on the island with 5 double bedrooms all with en-suite facilities, spacious living areas, and a fully equipped kitchen. The large terrace is the perfect location to enjoy an al fresco lunch or dinner with open views of the Aegean sea. The property features a large private swimming pool with sun loungers and parasols. This property offers complete privacy and luxurious accommodation with excellent facilities making it the perfect location for weddings and special occasions.